Not everyone is born with the perfect features. We're not all Jessica Albas and Ryan Goslings, here (though, if you could point me in the direction of that world made of Gosling carbon copies, I wouldn't necessarily be mad at you). And while I fully believe in loving yourself as you are, if a little makeup, hair dye or some Spanx makes us feel a little more confident about ourselves, there's nothing wrong with that. The same goes for home decor. You've seen all the hacks and touch ups I've done on some pieces around our house to make some otherwise unimpressive finds really stand out. It's amazing what tiny, simple little tweaks can do to transform a dusty old window, a dated bench or some uninspired cabinets. The same applies to those little tchotchkes that line the shelves at thrift stores across America. Grandma's kitten figures and weird wildlife knickknacks might look unappealing in their original state, but maybe they just need a little makeover? And suddenly they're transformed into some cute, bright home decor. You would've walked right by each of these pieces in their original state without even giving them a glance, but with their new makeovers they jump right out at you! 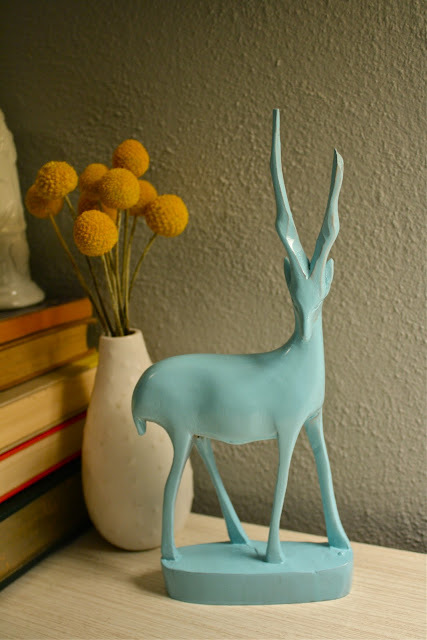 The owls are currently at home on our Expedit unit in the French room, while Mr. Teal Antelope sits atop the dresser in our living room (keeping our little gilded, leaping giraffe company). So the next time you find yourself in a thrift store, laughing at the gaudy figurines and statuettes piled up on the shelves, give them a second chance at a chic life with a simple coat in a bold hue. Because, unless you're Ryan Gosling, we could all benefit from a makeover now and then, couldn't we?